Practitioners of the medieval art of alchemy strove to transform lead into gold. While they were unable to prove and repeat this ambitious process, they did perfect the art of gilding – a practice of decorating gold or metal objects with a thin layer of gold-leaf that dates back to the Ancient Egyptians. Today, people use similar techniques to beautify all sorts of objects. 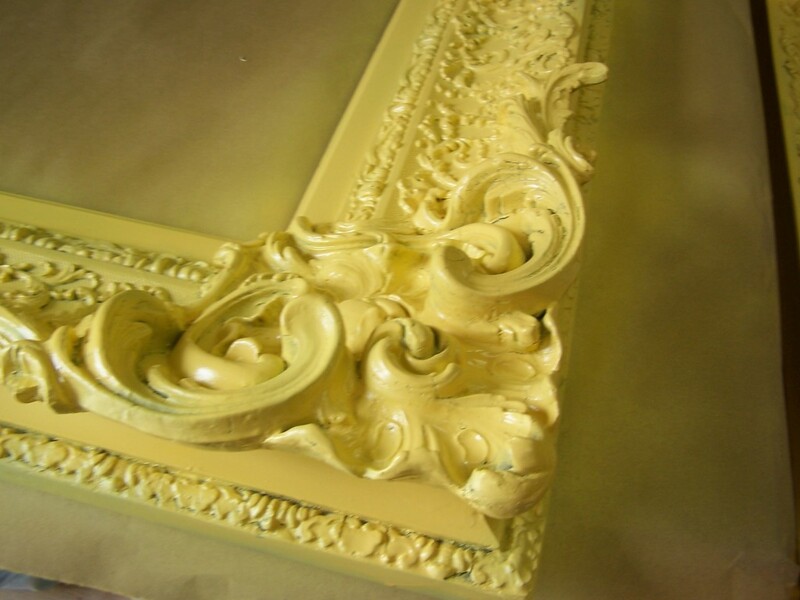 For this particular project, Kate Wood – owner of Alchemy Fine Art Restorers – first repaired and then oil-gilded an ornate antique frame in 22-karat yellow gold leaf. We hope you enjoy viewing these photos of a miraculous transformation! 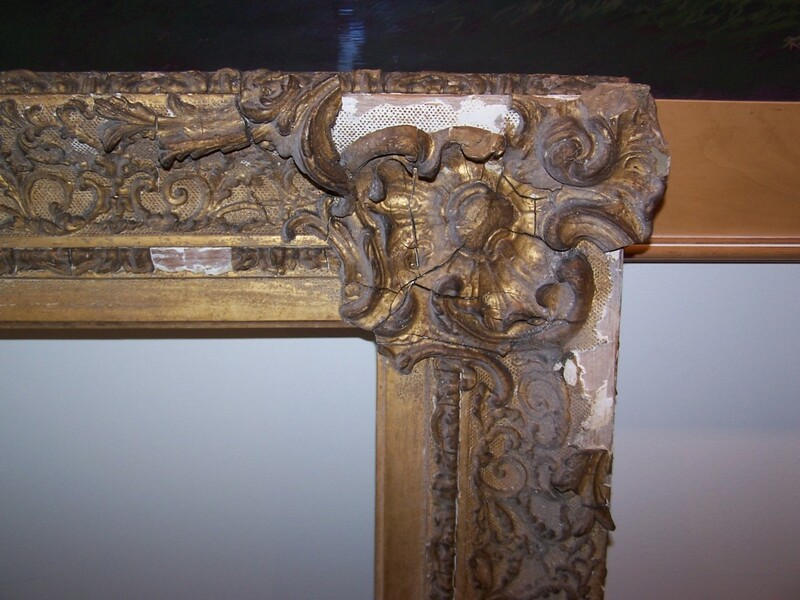 The frame shown had been stored in a humid environment and flood-damaged, which caused the plaster foundation that holds the ornament to the wood to fail throughout the frame. The first step Kate took was to run her hands over the entire frame surface to located all loose ornament and glue it back into place before any more of this already damaged frame could be lost. 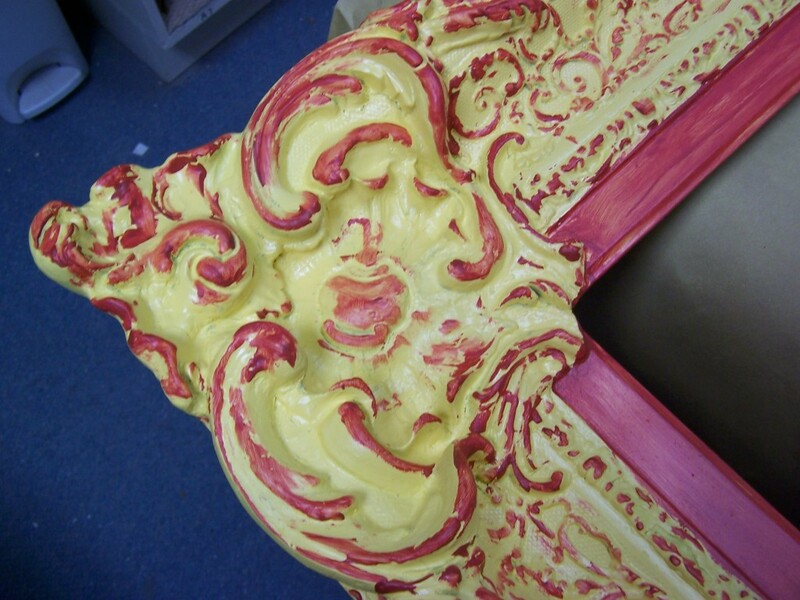 Because there was no comparable ornament, the corner shown in this example could not be molded and had to be hand-carved by Kate before gilding. 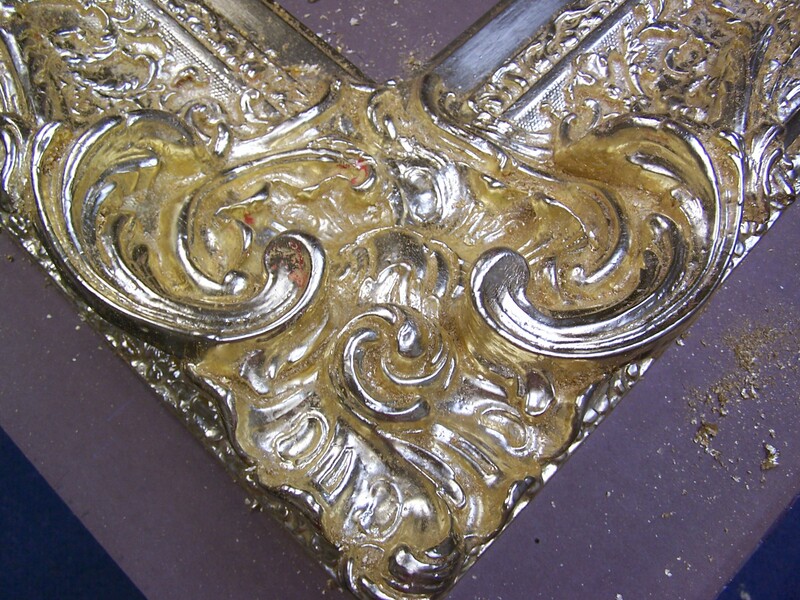 The result was a fully restored gilt frame with an authentic finish. 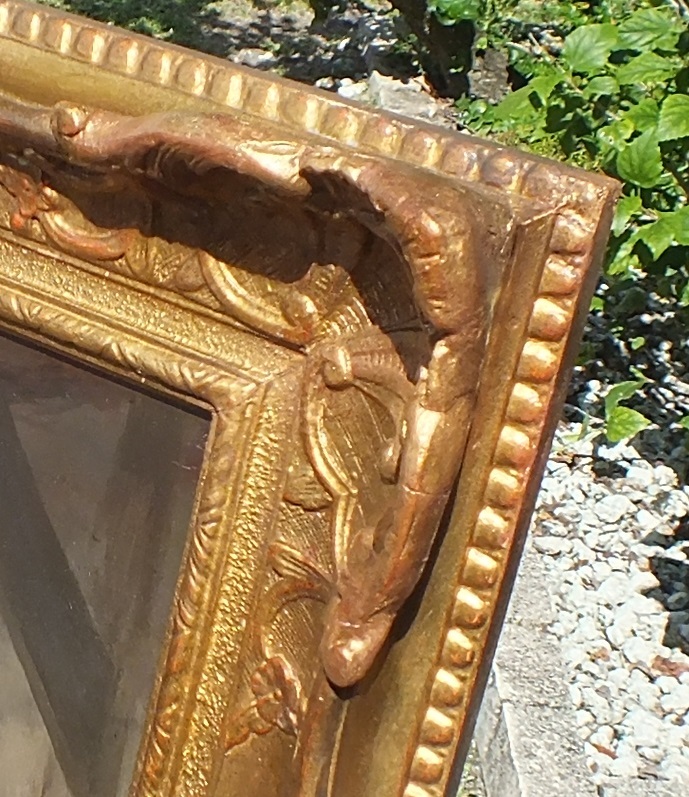 Missing ornament and degraded gilding on an antique frame. Carved plaster ornament repairs. Sometimes Kate molds these types of repairs. In this case she carved the plaster. Base coat of priming color to highlight the warmth of gold leaf. 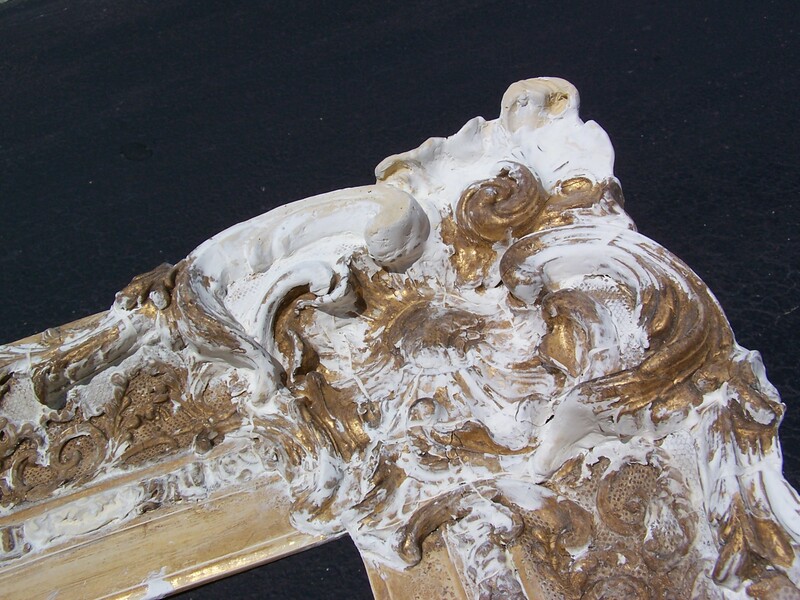 When oil gilding, the surface is primed with paint to seal the pores and provide a smooth non-porous surface to which a type of slow-drying oil can be applied. This oil provides an adhesive surface for the gold leaf. Red highlights mimic the look of clay bole. Clay bole is used in water gilding. After gilding, the gold is typically toned down to create an antiqued finish matching the tastes and preferences of the client. For example, to emphasize three-dimensional depth, a light brushing of artist’s oils in sienna and burnt umber (e.g., Japan Colors) could be applied to the recesses to add shadow and warmth. 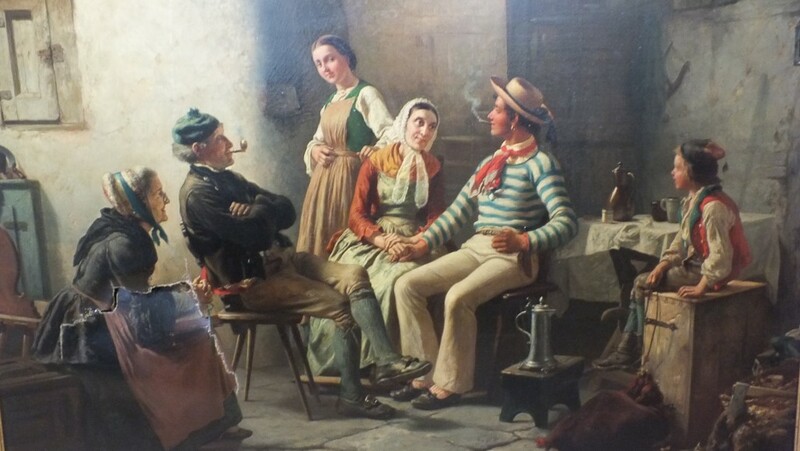 Alchemy Fine Art Restorers has been busy restoring everything from Moroccan doors to church iconography, but this oil painting was particularly intriguing. Carl Wilhelm Hubner (1814-70) was a genre painter who met with great success in Holland and America. His paintings are among the permanent collections of several European and American museums. Among his best known works are a series of paintings showing a young seaman returning home. 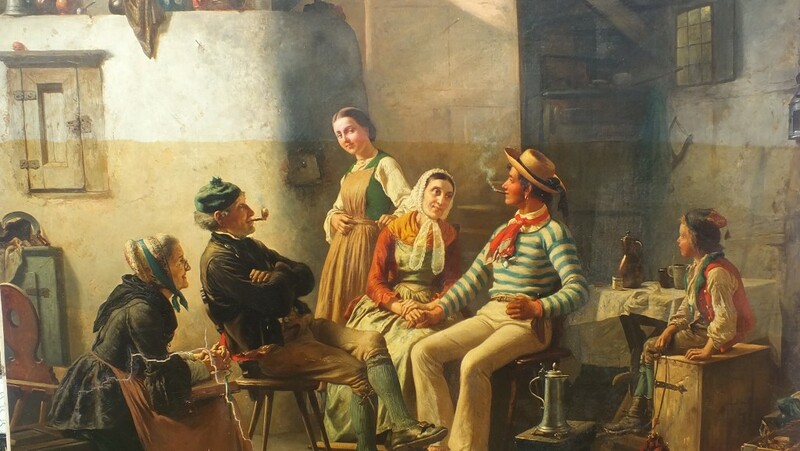 While similar in theme and composition, the paintings vary in the nationality of the sailor and his family. The version Alchemy restored below measures 36″ by 48″ and dates from the last decade of Hubner’s career. The canvas before repair of the tear or cleaning. 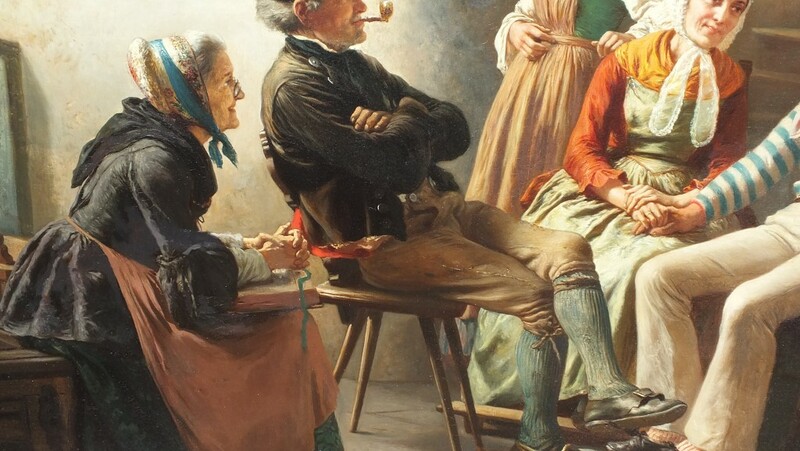 Restoring an oil painting is hard work! In this assignment, Alchemy owner Kate W0od lined the painting with fresh canvas and bees-wax. She carefully cleaned the canvas and removed old varnish. She removed previous attempts at inpainting and fixed the torn canvas, then covered the tear with reversible inpainting. 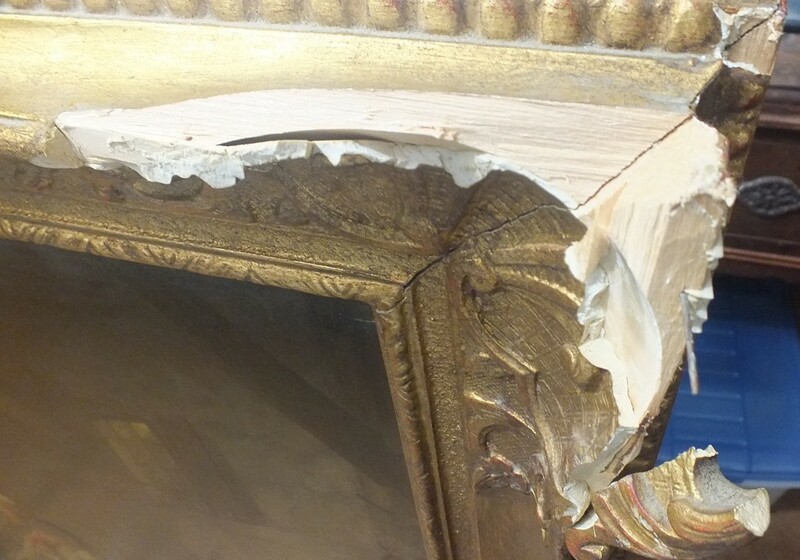 She also repaired the shattered corner of the frame using the original shards of wood, and re-gilded it. Lastly, she added a UV-protective varnish to the gloriously restored painting and returned the sailor to his home port. Severe damage to the canvas that needed restoring. 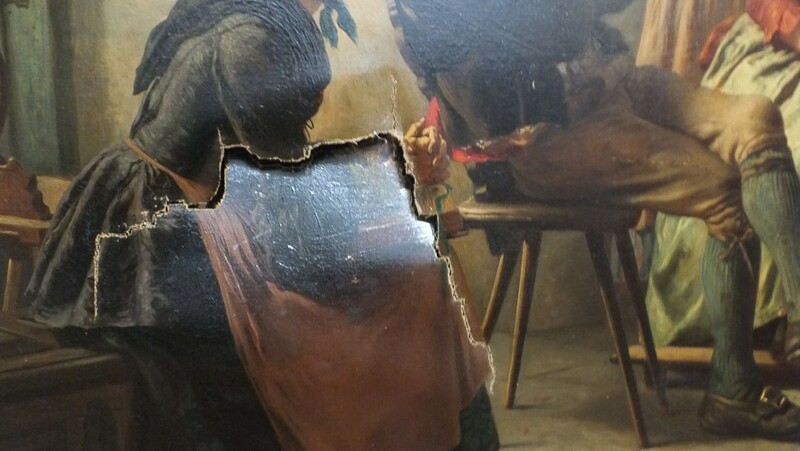 The damaged frame before any restoration work was begun. “Sailor’s Return” in the process of being cleaned by Kate Wood of Alchemy Fine Art Restorers. Repaired tear with in painting. All of the inpainting done by Alchemy Fine Art Restorers is entirely reversible. Carefully padding the painting for delivery to our client. 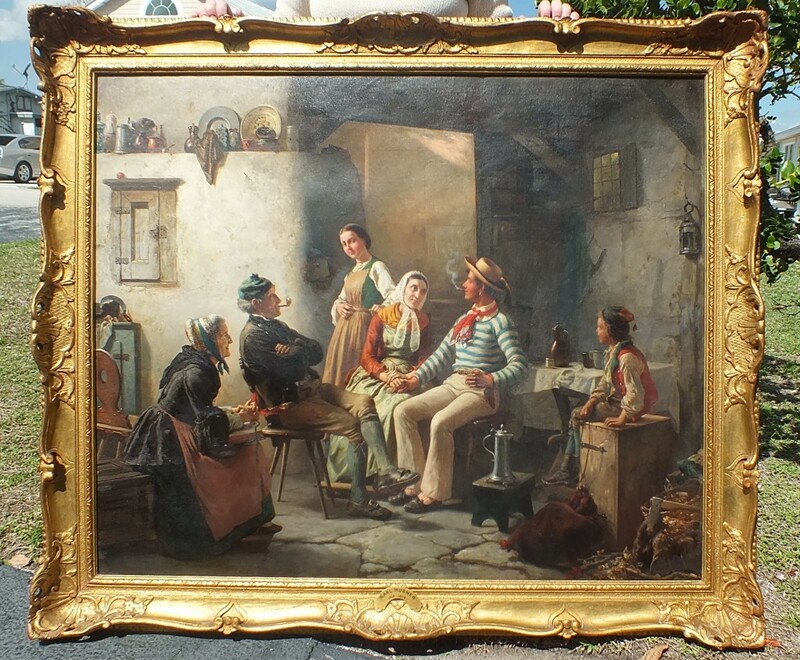 Restoring an oil painting is one of the most satisfying assignments Alchemy Fine Art Restorer’s can get. Not only is Kate Wood an expert in oil painting, but she gets to meet the most interesting private collectors. 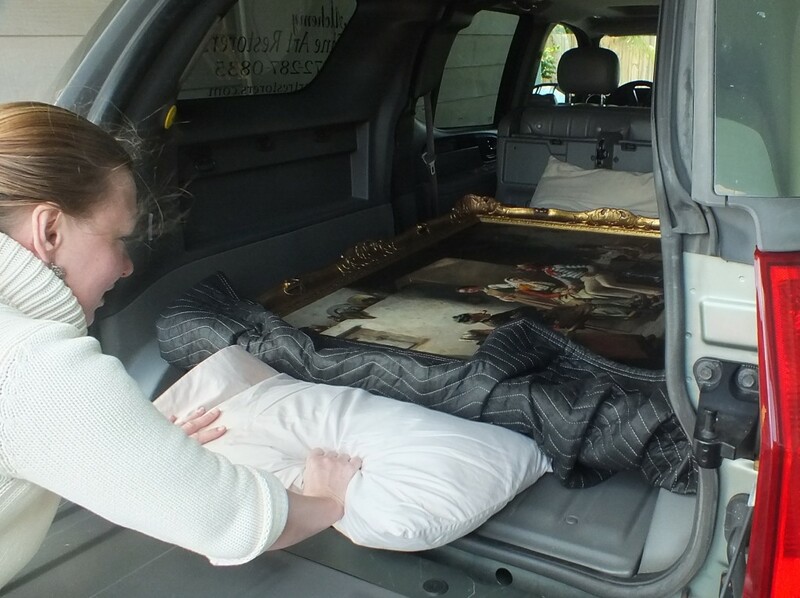 This was certainly one of those cases and well worth the time and care it took to rescue this delightful work of art.